Equine assisted psychotherapy uses horses as co-facilitators and teachers in this process to address a variety of social and emotional challenges in an experiential environment. The EAP form of therapy allows clients to explore mental health challenges and encourages insight and healing through an experiential approach. Therapeutic treatment groups are created based in individual mental health needs. This may serve as the primary form of treatment or in collaboration with other forms of mental health therapy. This powerful and effective therapy focuses on the promotion of trust, bonding, communication and the development of healthy boundaries. Nonverbal communication, assertiveness (as opposed to passivity or aggression), creative thinking, problem-solving, leadership, and teamwork are examples of skills and insights developed. Participation may result in development of personal responsibility and confidence, which may be difficult to teach in a traditional office or classroom setting. Equine assisted learning is a less intensive form of experiential learning and involves short term educational activities and goals that allow the horses to assist individuals in learning new skills and solving problems that transfer to life situations. These may include leadership skills, group dynamics, role definitions, trust, cooperation and communication. 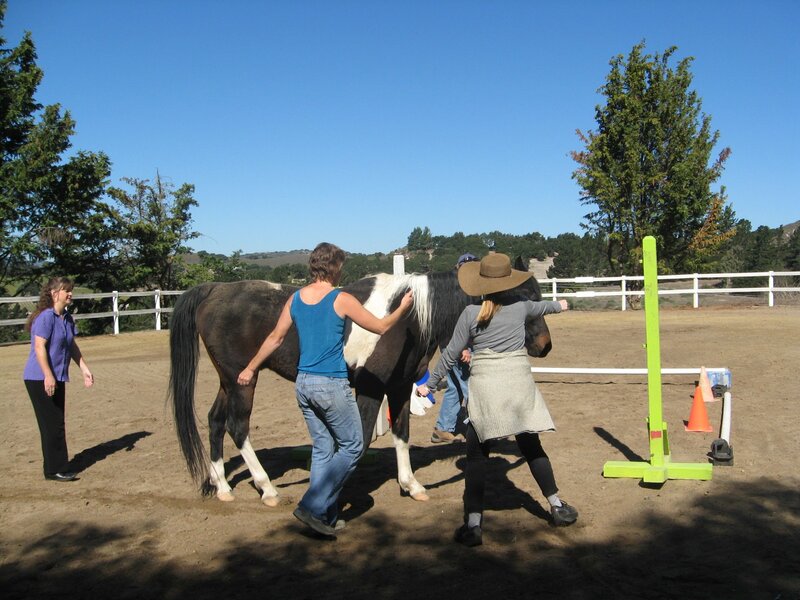 This equine interactive learning provides an opportunity to identify patterns of behavior and try new skills in a safe, but challenging, environment, receive instant feedback, immediate results and “ahas” in sometimes just one session. It may be helpful for corporate business teams, nonprofit organizations, educators, entrepreneurs, sports teams and individuals with specific social or work challenges. Research suggests that the long term benefits of EAP/L depends on both the active experiencing of new situations and activities and on the quality of the “processing” (reflecting, meaningful insights/metaphors and discussion). Thus the combination of the reflective, evocative capacity of the horses, the healing presence of the horses, and the skills and insights of the experienced mental health specialist work in synchrony to provide the opportunities for growth and healing. The effectiveness of this approach ultimately depends on the skill and insight of the psychotherapist and his/her ability to utilize the equine interaction to help facilitate healing and change. Otherwise it is just another “fun and different” activity.